As of the first day in drug treatment, addicts enter into a step-by-step process of change that works to undo the effects of addiction and create a lifestyle capable of supporting ongoing abstinence. Most all 12 Step drug treatment programs follow set protocols designed to promote ongoing growth and change throughout the recovery process. The Stages of Change model offers clinicians a means for gauging a person’s progress in recovery and adjusting treatment-planning efforts accordingly. 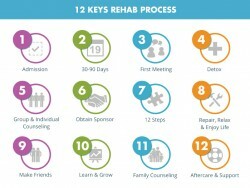 The 12 step treatment model provides a clear outline for recovery. The 12 Step drug treatment model views addiction as a disease of the brain in terms of the chemical imbalances that prevail and persist during the course of drug use as well as on into the recovery process. As this diseased state can bring on both physical and psychological impairment, treatment programs offer interventions designed to address both aspects of addiction. According to Stanford University, the 12 Step drug treatment model offers an effective approach to helping addicts overcome the effects of addiction in their daily lives. Likewise, rates of success from 12 Step drug treatment programs run higher than programs that only address the physical or psychological aftereffects of addiction. First developed in the late 1970s, the Stages of Change model centers around the decision-making process that takes place as a person works towards changing a behavior, mindset and/or lifestyle. According to Boston University, the Stages of Change model views change as an ongoing process that happens in cycles based on a person’s readiness and ability to take the necessary steps to make change come about. The precontemplation stage occurs during the initial few weeks in drug treatment when a person still harbors denial beliefs regarding addiction. This stage corresponds with Step 1 in the 12 Step program, an admission of powerlessness over addiction’s effects. Addicts progress through this stage once they can accept addiction for the “problem” that it is. During the contemplation stage, recovering addicts struggle with the pros and cons of sobriety and continued drug use. According to the U. S. National Library of Medicine, strong feelings of ambivalence most characterize this stage. Moving past the contemplation stage entails embracing Step 3 in the 12 Step program where a person surrenders to the will and guidance of a Higher Power. During the preparation stage, addicts develop a plan of action with the intention of following through in the immediate future. At this point, a person has obtained a sponsor and is in the process of working Step 4 in the 12 Step program, which involves taking a moral inventory of past wrongs done. Actual changes in a person’s daily lifestyle are telltale signs he or she has entered the action stage of the Stages of Change Model. During this time, addicts work on Steps 5 through 9 which entails following through on making amends to those harmed by his or her drug-using behaviors. Once a person reaches the maintenance stage, he or she has become immersed in the recovery community and lives a recovery-based lifestyle. People who’ve reached this stage continue to take a personal moral inventory as defined by Steps 10 through 12 in the 12 Step program. Recovery from addiction takes time and effort, but much direction and guidance is needed throughout this process of change. The support and guidance afforded through 12 Step drug treatment programs can be of great benefit to anyone wanting to overcome the effects of addiction in his or her life.